In a world that is ever more connected digitally I feel a desire and yearning for women to be able to connect with other heart centred beings on a more personal face to face experience. With my coaching work I LOVE, LOVE, LOVE working with women from across the world in the online space, but there is simply nothing like getting these beautiful creatures all here together in an environment where you just can’t help but be in awe of the mountains and the space that surrounds us here in the Alps. Now I know I go into a retreat with a completely different perspective as the retreat leader, compared to someone who is coming away on a holiday. But, I always like to blog about the experience because at the end of it all, I work to create these experiences for people who are just like me. People who have a love of getting outdoors, who want to experience new things, taste new foods, meet new people and want to have a blast in the process. From the moment the Snow & Yoga 2018 group met, everyone was instantly chatting away and while some knew of others, many of the guys came alone, not knowing anyone at all. It didn’t seem to matter either way, within a few hours it was as if we had known each other for weeks. Another reason why I write the blogs and posts in the way that I do. If you read this and get annoyed at my relaxed writing style, spelling mistakes and grammatical errors, chances are you won’t be a good fit for my retreats. I am a very chilled out person and have will have the tendency to swear at you every now and then and so if that offends you I make no apologies, as this is usually a big part of the reason we had such an awesome group of ladies, they kinda already knew what to expect. However if you do read this and think hell yeah, you sound like my type of people, then chances are you are going to freeking love coming away on retreat with us. 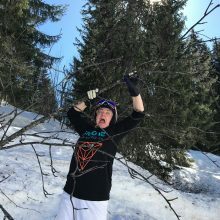 Snow & Yoga retreat 2018 was my first experience of running this style of retreat but it honestly was everything that I hoped it would be and more. For a start the weather was just simply perfect. 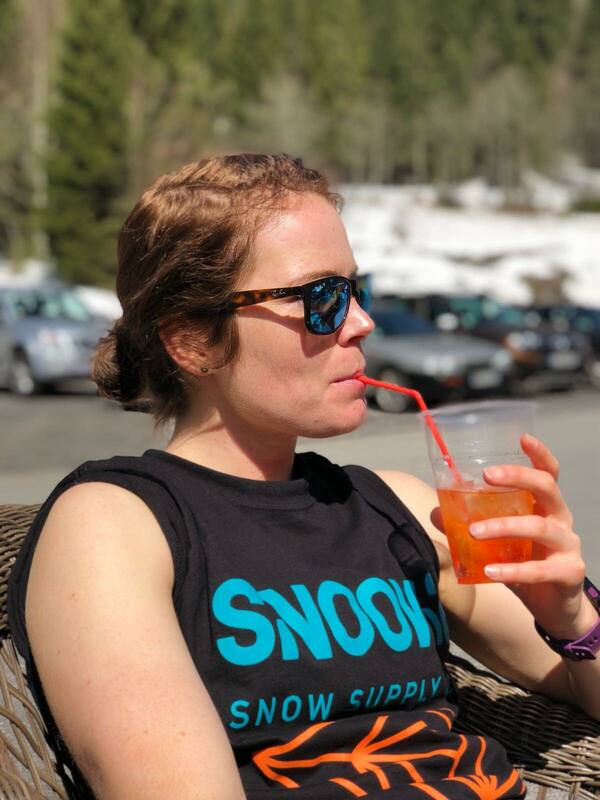 For the entire week we were up on the mountain skiing and boarding with just our t-shirts on and afternoon yoga slathering on the suncream in an attempt to not get burnt. Never underestimate the strength of the sun in the mountains, coupled with the reflection from the snow and get burnt we did. My lips suffered the most, getting blisters and cold sores, so be warned top tip for next year, high factored lip balm is a MUST!! 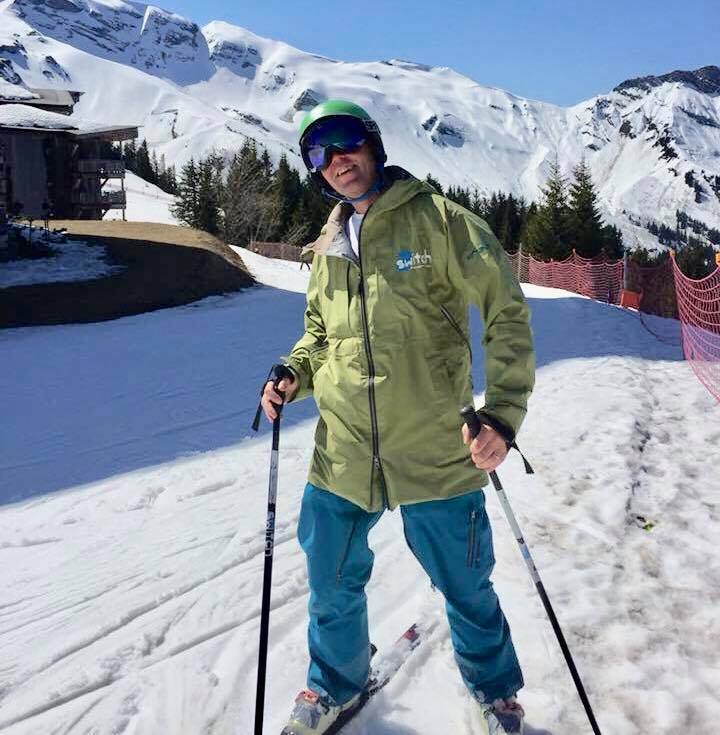 We had worked the schedule so that the mornings consisted of our ski and snowboard lessons so that we could hit the piste while the snow was still quite firm and fresh. 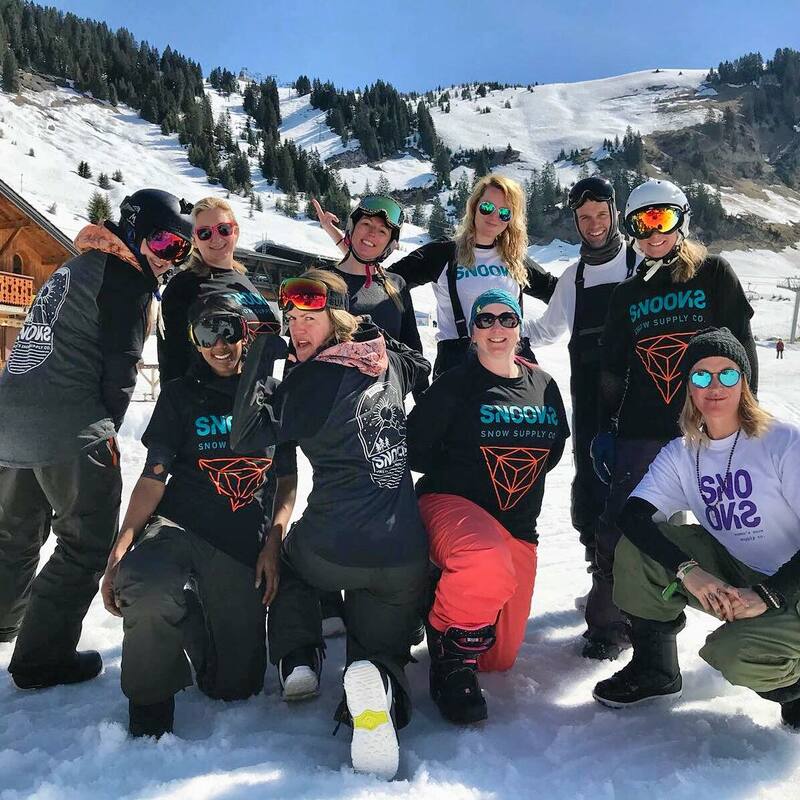 Our skiers were taken on by Nathan from Switch Snowsports and the Snowboarders with Stephan from Real Snowboarding both of which were incredible and we can’t thank them enough for their patience and top level instruction. Each of the ski and snowboarder groups are then split up into levels so that they were with people of a similar ability. I am always so inspired by the beginners who for many of them this was the first time of actually being up on a mountain never mind having to also contend with snow and the small fact of having ski’s or a snowboard strapped to your feet. Having grown up doing snowsports I always have to take the time to appreciate how scary it is doing something for the first time. Have you ever noticed that the older things just seem that little bit scarier than when you were younger? But again it’s why we run these retreats because doing something for the first time is scary but it’s also exhilarating, to live a life that is full of amazing experiences is often about getting out and doing the things that scare you the most. And these ladies did it, they pushed themselves every day to do a little more and be a little better, to not give up, and I am so proud of all of them. It was the same for the more intermediate guys too, everyone went away feeling as though they had improved and many going with new skills in the bag, which always feels pretty darn good. Throughout the week they were set a series of challenges to complete, I don’t want to give you too many details because you know, somethings that happen on retreat have to stay on retreat! I also don’t want to ruin the surprise for anyone that may be joining us next year. But the ladies embraced the challenges, gave it their everything and we had a freeking load of belly laughs as we watched their challenge attempts on awards evening. 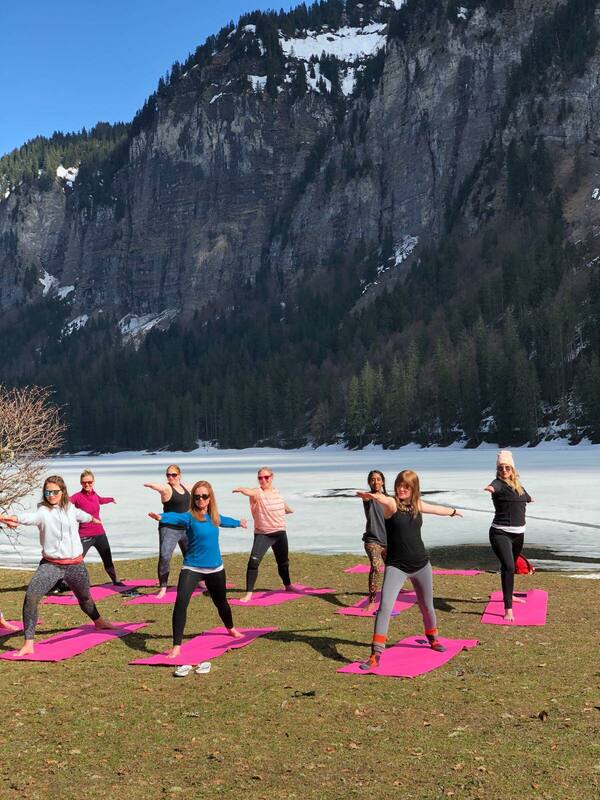 After lunches in the sunshine and some afternoon playtime in the slush, which is so playful and fun, we would gather the troops and head off for some afternoon yoga and took up the simply stunning location down by Lac Montriond. Doing yoga in such a place is really something that sticks with you. I cannot even begin to express the feeling that comes with doing movement mindfully in such an incredible space. To stretch and release the body, to re-focus and calm the mind is truly an experience that will stick with me and I feel incredibly grateful for. And I know that it will with the guys who took part as many of them opened their eyes after the session were filled with intense feelings of emotion. Mimi is an incredible yoga teacher, able to adapt the sessions for all levels and give real insight and instruction to help everyone enhance their practice over the week. Even those that had never done yoga before (and to be honest were a bit worried about being rubbish at it) walked away feeling as though they not only got benefit from it but enjoyed it so much they are even considering keeping up with it now retreat is over. 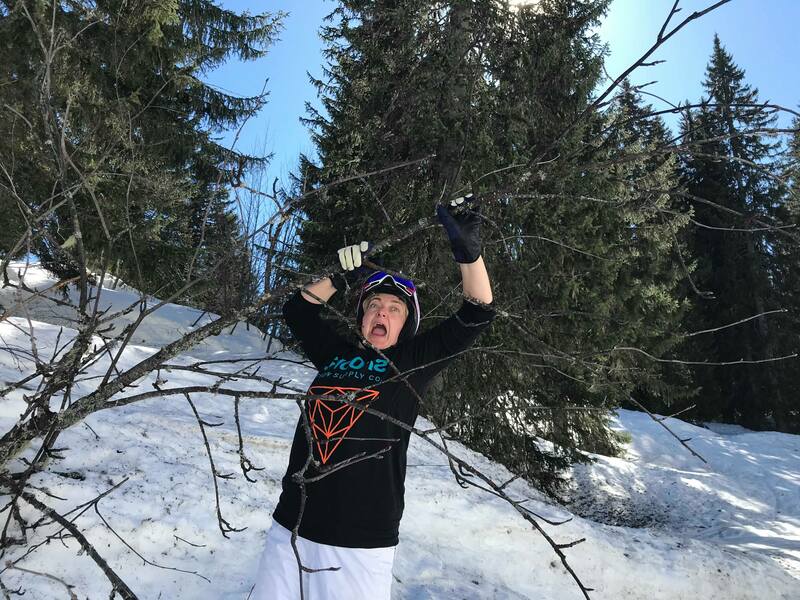 And the feeling of just giving that loving kindness of a stretch session after a day on the slopes is just like, ahhhhhhhh!! 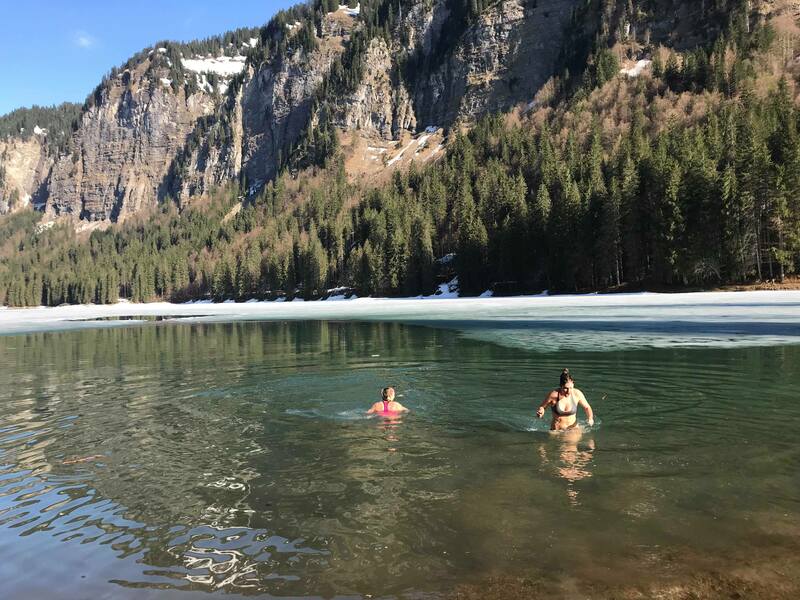 At the start of the week there was still a layer of ice over the lake but by the end of the week this ice had begun to melt and so on the last session it seems like the perfect opportunity to have a refreshing dip to ease tired muscles and actually cool some sweaty bodies down as it was that HOT!! Think ice bucket challenge x 10!! Another great insight for many of the guys was the food. 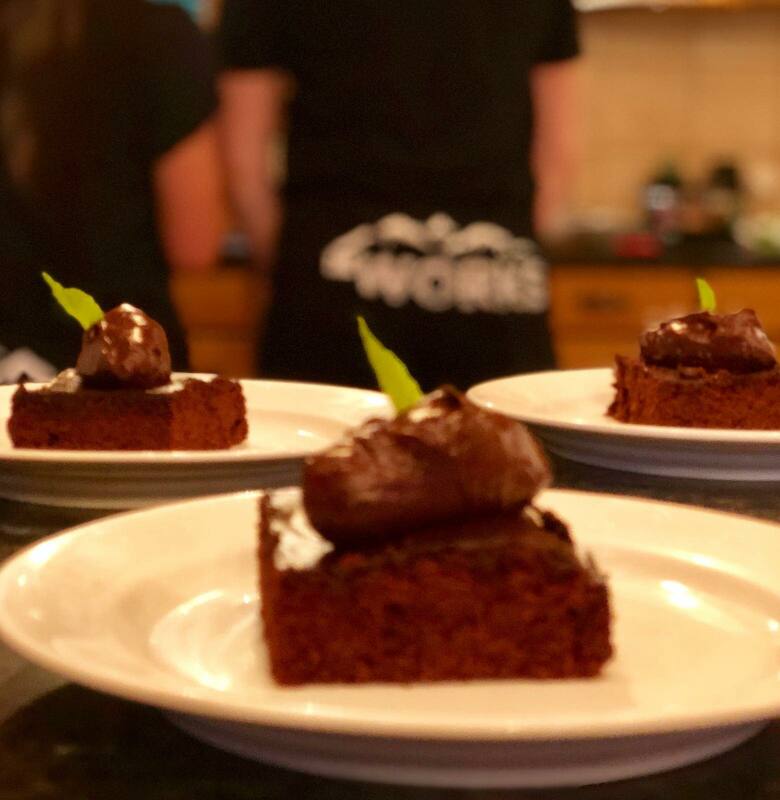 We provided a vegan menu, which we realise can sometimes feel a little intimidating for some people, which we totally understand and appreciate. It is not our intention to push any thoughts or beliefs around how you ‘should’ eat on to you. Rather it’s our intention to introduce you to new foods, to allow you to take a break from eating meat and allow your digestive system a rest as much as anything else. The girls still had the flexibility to eat whatever they wanted for lunch, and on the mid week meal out times but no one felt as though they had been deprived, in fact they all mentioned that they actually enjoyed the chalet food more than they enjoyed the food on the meal out. Some other feedback was that one lady who had been suffering with heartburn for a significant period of time prior to retreat didn’t have a single bout of it. And what's even better they have been posting and sending their vegan meal choices these past few weeks because they enjoyed it so much they now want to keep up with it. Freeking amazing!!! We closed of the week with a trip to the thermal Spa over in Switzerland. 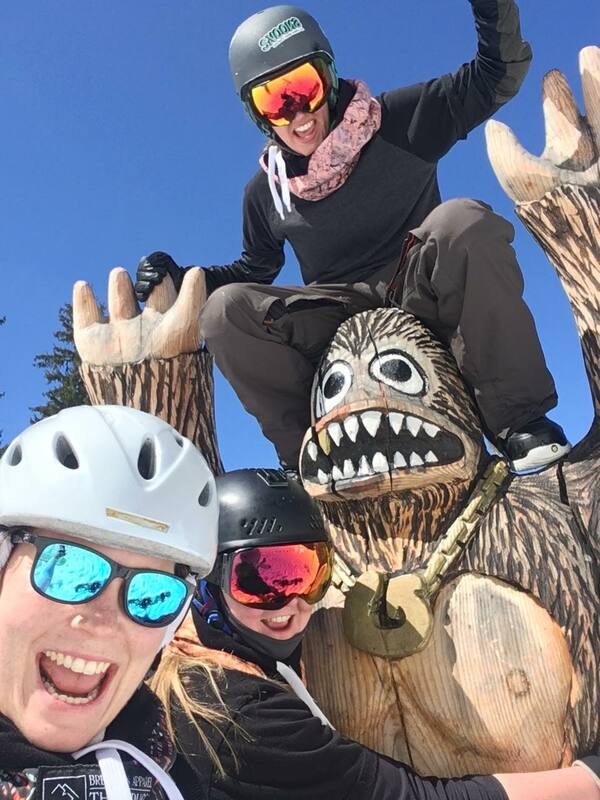 This trip was optional as some of them decided to spend the final day on the slopes, but for those who did go (myself included) thoroughly enjoyed having a down day and an opportunity to just rest before returning back home and into the real world. Watching the group grow, learn new skills, feel proud of themselves for their achievements, being silly, having fun, connecting with each other and having sometimes really deep conversations was incredible to witness. I feel truly grateful to have been able to create this experience and enjoy it with such wonderful people and I literally cannot wait to do it all again next year. It seems I am not the only one, a testament to the success of the event that so many of them want to come back again too. Next years dates are 31st March-7th April, so if you would like to come and join us get in touch quick as we are already down to the last few places. CLICK HERE to see our full list of the next available retreats. Thanks for taking the time to read this post and if you know someone who also has a love of adventure and the great outdoors, please do share this with them. And of course if you have any questions leave them in the comments below.